WPI Project Team Awarded “Green Apple” for Work at University of Worcester in U.K. 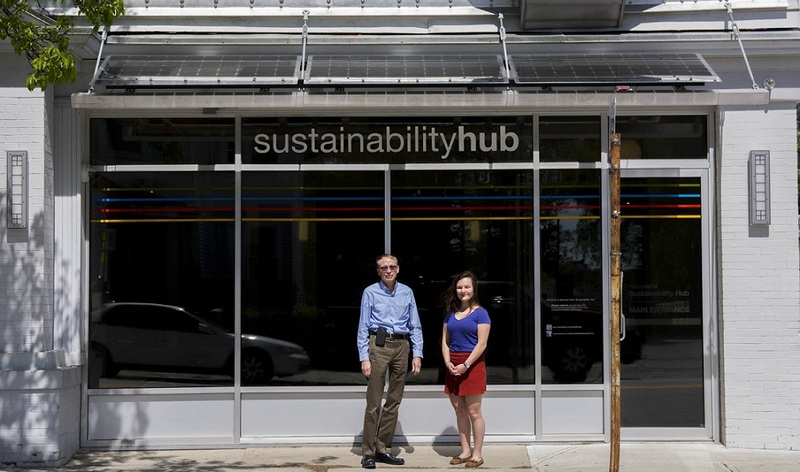 Thanks to a WPI IQP, National Grid’s Sustainability Hub in Worcester’s Main South neighborhood has a new solar awning that works double duty as a way to capture energy while also controlling heat. Team members from last year’s IQP “Capturing Solar Energy at the Sustainability Hub” have both the satisfaction of seeing the project come to completion in its original intent and also of making an impact right in Worcester. “This project ended last year as an IQP and then came back with the installation of the awning,” says John Orr, director of sustainability and professor emeritus of electrical and computer engineering (ECE). that measure the energy produced by the awning. Senior Jacqueline Campbell says she knew when she signed up for an IQP with Orr that National Grid would be sponsoring the project. As an ECE major with a strong interest in the power industry, Campbell is especially curious about all the changes the industry is going through now and will see in the near future. She and her IQP teammates, Sakiynah Ahada Howard and Zilu Tian, also produced educational materials on the use of solar energy. Despite knowing the project sponsor, Campbell says they weren’t sure what they would be tasked with, but expected to find the end result satisfying. They knew they needed to capture and harness the sun’s energy that was radiating through the front windows of the Sustainability Hub, a National Grid center for educating the community on sustainability, Campbell says. In an ironic twist, the abundant sunlight on a clear day heats up the Hub interior to uncomfortable levels, so they also needed to minimize the heat allowed in through the windows. The project used a photovoltaic system to capture solar power for electricity while shading the windows. The team designed a couple of different approaches for the Hub, and they knew they wanted a project that would be useful. “We wanted something that could be implemented,” Campbell says. One of their initial design ideas was a bus stop shelter with photovoltaic covering. The high cost of the project and the actual logistics of construction and maintenance of a structure on a city sidewalk made the project tough to implement. And solar panels on the roof were also considered, but the area was unsuitable for panels. The awning juts out about three feet to remain within Worcester city building ordinances, says Orr, and appears to be the first of its kind in the Worcester area. The solar awning at the Sustainability Hub. Campbell says aside from the actual design, learning how to navigate the business side of the project was a challenge. In addition to the logistics of considering city regulations and getting the proper approvals in place, she says something as simple as learning the proper channels and people to get in touch with was a learning experience. When she ended up working as a National Grid intern last summer, she felt more comfortable with those processes. Her experience is exactly why Orr says he likes projects that are sponsored by industry partners. In addition to the corporate experience, students get a real satisfaction from seeing the project through to an end result, he says. “Often a final implementation from an IQP is more of taking one or two ideas or using the IQP as a jumping off point.” The ECE department has long had a collaborative relationship with National Grid, he says, so the IQPs are often targeted projects that have real value in society. Seeing the awning in use shows Campbell how those changes will benefit society. “It was almost surreal,” she says about being present at the awning’s unveiling. “Most IQPs don’t come to fruition.” And the opportunity to just go a couple of miles and see the result of her team’s work is nothing short of thrilling.